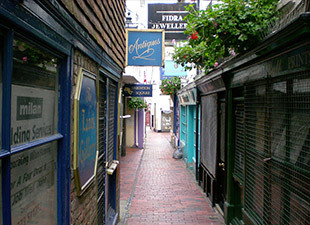 The Lanes are a collection of narrow lanes, famous for their small shops (including several antique shops) and narrow alleyways. According to Coxe, The Lanes in Brighton are haunted by the apparition of a nun dressed in a grey habit. Pictured are the Lanes courtesy of Frank Jepsen. For further information, please read please read Haunted Britain by Antony D. Hippisley Coxe. Brighton is a seaside resort in East Sussex, England. It lies between the South Downs and the English Channel to the north and south, respectively. Pictured left is Brighton Pier courtesy of hozinja. Licensed under CC BY-SA 3.0 via Wikimedia Commons.